I have written about the Relativity Spring Roadshow and linked to the products announced at it. I turn now to the four sessions which preceded CEO Andrew Sieja’s keynote. I will not try and summarise each of the panels, not least because the multitasking David Horrigan kept up a stream of live tweets and collected them together. David Horrigan has also published his own report of the sessions while mine was in draft (he was a journalist among other things, and therefore skilled at producing good copy quickly). I will content myself with picking perhaps two points from each of the discussions. I have to be careful here, because I was responsible for half of the programme, at least in the sense that I moderated two of its four panels. That was a largely notional responsibility, akin perhaps to being the person sitting in the front seat of an autonomous car. The “driver” in fact does no more than indicate where he or she wants to go, leaving some very clever technology to do the rest; similarly, my role in these panels was limited to saying where I wanted to go, leaving it to some very clever people to take us there. 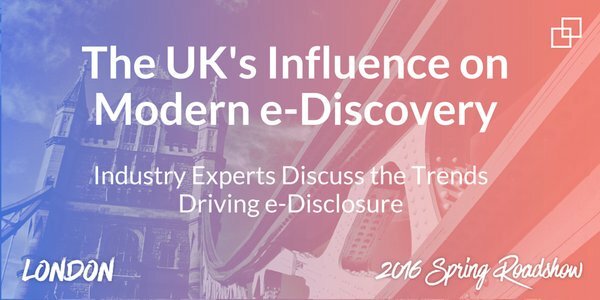 First up was a panel called The UK’s influence on modern eDiscovery. David Horrigan moderated and Jonathan Maas of Consilio, Nick Patience of 451 Research and Sean Pike of IDC set about undermining the general US perception that “the US is two years ahead of the UK” when it comes to eDiscovery. David Horrigan’s tweet summary is here. Jonathan Maas had a one-word answer to the question about the UK’s influence on eDiscovery: proportionality. We are beginning to hear the word used in US eDiscovery; its problem there, perhaps, is that proportionality is a sliding scale, a relationship between the value of an exercise and the cost of getting there. It is not a criticism to say that Americans like bright lines round obligations; they like to know where they are stepping from right to wrong and vice versa, and proportionality, along with judicial discretion, does not give them that certainty. The other key point which arose from the session, again opened by Jonathan Maas, related to privacy and data protection. The UK, he said, acts as a kind of buffer between the strictness of EU approaches to privacy and the broad demands of the US which take little or no account of it. The UK is, he said, “pragmatic” about it which (as the other panellists agreed) makes the UK a an ideal choice for locating data servers and services. That led to a discussion on the implications of Brexit. My first panel was called What the age of privacy regulation means for eDisclosure and compliance. The panel members were Gayle McFarlane of Cordery and Ari Senders and Mark Cordy of KPMG whose respective skills and specialist areas neatly complemented each other. Gayle McFarlane gave us the statutory context; Mark Cordy focused mainly on where responsibility falls within an organisation for the compliance issues ahead; Ari Sender’s role is the reactive one of dealing with problems when they arise. Between them they gave us a very broad coverage. Subject Access Requests are important, both for themselves and for their role (rightly or more usually wrongly) in putting pressure on the corporate recipients of the request; I sometimes wonder whether organisations overlook this burden in deciding what resources they should apply to eDiscovery tools and skills. However fearsome the enforcement potential in the GDPR, and whatever burdens may arise because of US demands for data which we are not allowed to give them, the biggest single threat to corporations worldwide comes from hackers and others who exploit weaknesses in corporate information systems. There is only so much budget and resource to go round. All these issues overlap and will, I said, be a driver towards the apparently amorphous concept of information governance – if you keep less stuff, and organise what you have, then your risk diminishes across a number of fronts. I did not attend the third session as I was taking a breather between my own. 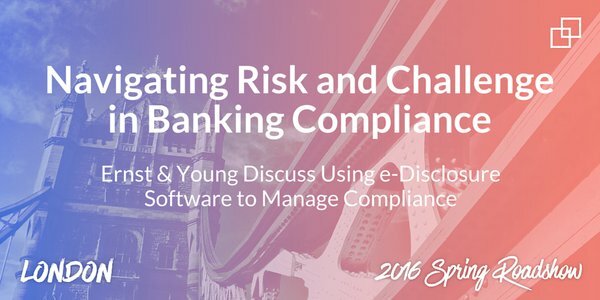 It was called Navigating risk and challenging banking compliance and was presented by Brian Stuart and Rhys John of EY. The dominant theme seems to have been that eDiscovery skills and tools are being applied to wider compliance issues, not least by using new analytics tools. The last session, again moderated by me, was called Applying the Pyrrho decision more widely. 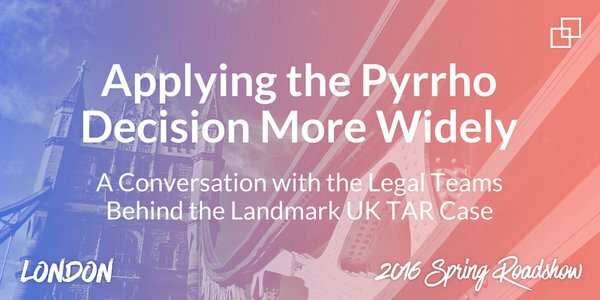 Greg Houston of kCura helped us with the technical side, while Ed Spencer of Taylor Wessing and Dan Wyatt of RPC, the chief protagonists in Pyrrho, gave us the legal story. I have written a fair amount about Pyrrho already. The two points which interested me from this session were not really predictive coding points at all. The first related to agreements between the parties. In Pyrrho, the parties agreed on the tools and the methodology to be used; Dan Wyatt and Ed Spencer made it clear that there had been hard-fought battles to arrive at the agreement, and they emphasised that the pragmatic “get in a room” approach was in fact required by the rules (Rule 31.5(5), as I am sure you know, requires discussions “at a meeting or by telephone”). The main point which arose here was this: if you do not agree on the scope and method of disclosure and have to ask the court to make decisions for you then you are, as I put it, “dipping your hand into the bran tub of judicial discretion”, perhaps getting an order which pleases none of the parties. The second point of significance is similarly a plea to lawyers to work out ways of getting the eDisclosure job done without undue expense before someone – rule-makers or clients – takes the whole job from under your nose. Some lawyers, perhaps, still see disclosure as a cash cow, maximising its scope and ignoring ways to bring the costs down. Many more do not know what the rules require and are unaware of “the tools and techniques (if any) which should be considered to reduce the burden and cost of disclosure of Electronic Documents” (as PD31B puts it). One of the risks is that the rules will move towards dispensing with disclosure completely (I referred to the Practice Direction SC Eq 11 to that effect in the Equity Division of the Supreme Court of New South Wales). The other is the possibility that parties will agree to take their disputes to other jurisdictions. We have seen the rise of the DIFC in Dubai and the Singapore International Commercial Court, along with Singapore’s mediation and arbitration initiatives. You do not, of course, have to go to Singapore to find non-judicial ways of resolving disputes. (By chance Singapore turned up in this context in an article I found the following day; I will write about that separately). In his video interview summarising the day, David Horrigan picked up on this point, suggesting that the US, as well as London, might lose dispute resolution work to other fora and other jurisdictions if we do not get discovery / disclosure under control. We got good audiences for each of these panels – better than at many mainstream conferences, both in the number of people attending and for their the hands-on responsibility for dealing with the issues we discussed. My thanks to kCura for the opportunity to take part with panels like these ones. This entry was posted in Consilio, Discovery, eDisclosure, eDiscovery, Electronic disclosure, Ernst & Young, KCura, Relativity and tagged Ari Senders, Dan Wyatt, David Horrigan, Ed Spencer, Gayle McFarlane, Jonathan Maas, Mark Cordy, Nick Patience, Sean Pike. Bookmark the permalink.